The earbuds are powered by a 120maH battery, good for up to eight hours of use (and 180 hours of standby). They take about 90 minutes to fully charge from empty, and they do seem to hold their charge well—I left mine unplugged and unused for about three weeks, then used them on a 90-minute treadmill session without running out of juice. I haven’t stress-tested the eight hour in-use claim, but I used them over six hours before plugging them in the first time. The charging port is in the control block (see next section), and has a small rubber cover to help keep the water out. This rubber cover fits well, but it’s a bit tricky to get it fully back into the port opening after charging—perhaps having smaller fingers would help, as it’s a very small piece. If there’s one thing on these earbuds that’s likely to break, I’d guess it would be this cover—though so far, mine’s still attached. I found it easy to pair the earbuds (which use Bluetooth 4.1) with both my phone and my Mac, though you can’t use two source devices simultaneously, obviously. The signal strength was very good; depending on what was between myself and my iPhone, I was able to move well away from my phone with no reception issues. The cable joining the two earbuds holds an inline control box with three buttons (volume up and down; multifunction) and the USB charging port. Using these buttons, you’re able to play and pause, jump to the next or previous track, answer or reject a phone call, put a call on hold, and even redial the last called number. The microphone is also located on the control box, which I thought might be a bit troublesome. I don’t make a ton of calls on my phone, but I made a few while wearing the earbuds, and the people I was talking with said I sounded fine, so the microphone’s location seems to be a non-issue. Because there are more functions than buttons, you do have to remember various actions—press-and-hold on the volume up button to skip a track forward; press and hold on the multifunction button to reject a call; press that button twice to hold a phone call, etc. These are all documented in the manual, and if you use the earbuds regularly, they should become second nature. For me, they did for the music controls, but not so much with the phone controls, because my phone is so rarely used as a phone. I’ve used the SG1s for about 15 hours of music listening, and I find the sound to be very good. It’s certainly not as good as my over-ear Sony MDR100-ABN headphones, but those are a totally different product in a totally different price bracket. Compared to my current earbud of choice, the wired Sony MDRAS800AP ($39), I preferred the sound from the Sony’s, but only by a bit. For a Bluetooth headphone that’s most likely going to be used while exercising or in a similarly non-perfectly-quiet environment, I think the SG1s sounded very good. I did have an issue with sound quality the first time I tried using them: The bass and midrange both sounded flat and tinny, but only some of the time. Eventually I figured out that if I had my mouth closed with my upper and lower jaw touching, the sound was much better (tooth enamel conduction FTW!). If I opened my jaw at all, though, the sound got bad. As a test, I swapped out the medium ear cushions for the large cushions (which is very easy to do), and the problem went away. I assume the smaller cushions weren’t fully sealing my ear cavity. The SG1s are IPX4 rated, meaning they can survive a direct water splash for at least five minutes. In reality, this means they’re very much sweatproof, and might do well in a light rain, but you probably wouldn’t want to wear them in a downpour for a couple hours. I’ve worn them for about eight hours of treadmill work—not in a row!—and they’ve held up fine to my sweaty head. The SG1s also stay put in my ears very well, and are quite comfortable—I had no discomfort after even 120 minutes of continuous use. They have one additional neat feature, visible in the photo above: When you’re not wearing them, the two earbuds magnetically snap together, making it easy to leave them looped around your neck. 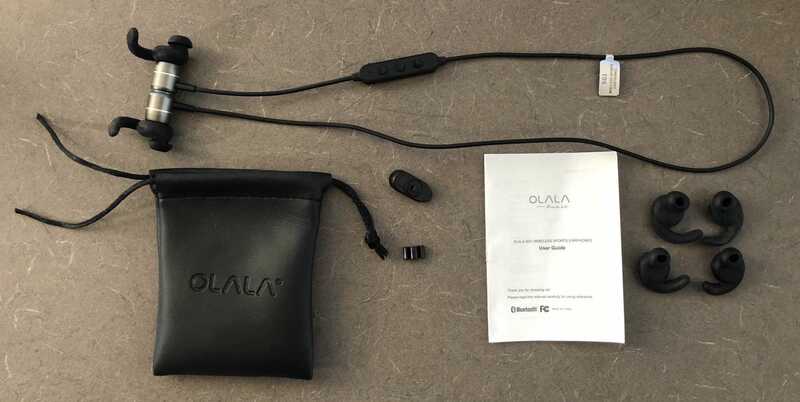 I found the Olala SG1s to be comfortable good-sounding earbuds, and a great value at the $32 asking price. For that, you get up to eight hours of cordless convenience, good sound quality, a useful magnetic-lock “necklace” feature, and a full set of accessories. Build quality seems good, based on a couple months’ use—mine still look new, and I haven’t had troubles with any of the parts. If you’re looking for a set of Bluetooth earphones for use while exercising, these seem well suited to the task.